Are looking for a place to hangout and drink a cup of newly brewed coffee or latte? Well, I think this is the place for you. Either you want to study for your exams, close a business deal, chill with your friends or have a good talk with your significant other, I recommend this place. It has a cozy and homey look with a little bit of vintage touch. So what's the name of the coffee shop? 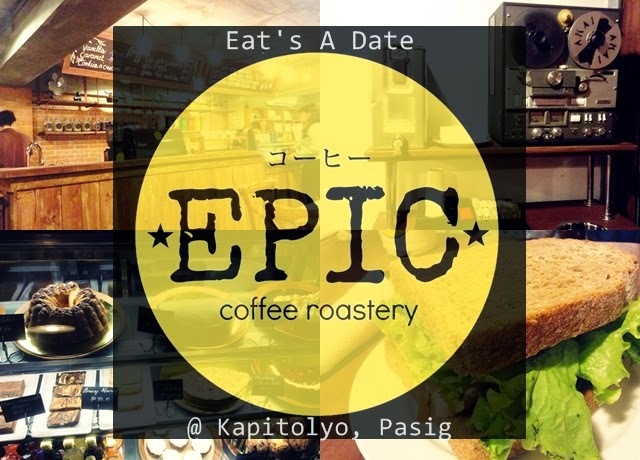 It is called Epic Coffee Roastery. It is located along Kapitolyo, Pasig City. It is a sister company of Poco Deli. That's why they have the menu from Poco Deli. If you want something from Poco Deli, they will get it for you. The price ranges to 100 pesos to more or less 200 pesos. The counter. The girl ordering is my friend Dale, she's the one who recommended the place. She knows a lot about coffee. She is one coffee drinker for sure. They have cakes, cupcakes, breads, brownies and non-caffeine drinks available in the counter. The silver container on the left side is water dispenser. Cool, right?